Any good sports bar would seem incomplete without Buffalo chicken wings on the menu. But have you ever wondered where Buffalo chicken came from in the first place? Or how it got its name? We’re uncovering the history behind this spicy game day staple in American society. The very first plate of Buffalo wings was served at Anchor Bar in Buffalo, New York. According to the story, the secret recipe originated on a Friday night in 1964, when bartender Dominic Bellissimo asked his mother, Teressa, to whip something up for a few regulars who arrived at the bar around midnight. Teressa found some chicken wings in the kitchen, fried them up and flavored them with a secret sauce. The wings became an instant hit with the customers and a permanent addition to the Anchor Bar menu from that night forward. Calvin Trillin, a regular contributor to The New Yorker, investigated the story and discovered that Dominic’s father, Frank Bellissimo, had a slightly different account. According to Frank, the famous wing recipe all started with a mistaken delivery. The Bellissimos normally used the backs and necks of the chicken in their spaghetti sauce, but wings had been delivered by mistake. Frank asked Teressa to find a better use for them than the sauce, and the Buffalo chicken wing was born. Whichever story you believe, both Dominic and Frank agree that the famous Buffalo chicken all began with Teressa Bellissimo. She chopped the wings in half, deep fried them, added hot sauce, and served them alongside celery slices and blue cheese dressing for customers to eat with their fingers. Within just a few weeks, the wings were famous throughout Buffalo. For a while, Buffalo wings existed mainly in New York and surrounding states. However, it didn’t take long for them to spread throughout the country. 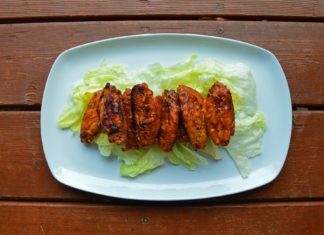 According to the National Chicken Council, the rise of the Buffalo wing as a sports food had everything to do with timing. In the 1980s, American consumers preferred buying boneless, skinless chicken breasts over the whole chicken. Wings then became an inexpensive byproduct for chicken producers. Around the same time, sports bars with televisions were becoming more and more common around the country. Bar owners realized they could buy the inexpensive wings to sell to their customers at low prices. In return, beer sales would skyrocket due to the spiciness of the wings – it was a perfect match. 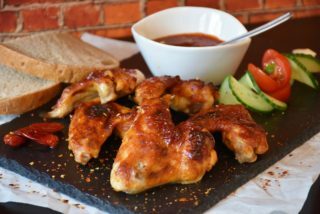 From then on, the Buffalo wing was a popular food to share with friends while watching football and drinking beer. 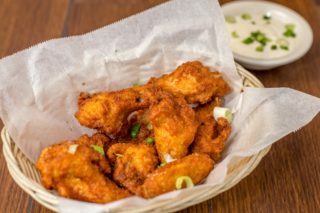 Once considered the least desirable part of the chicken, the wings are now the most expensive part due to their popularity when fried and slathered in hot sauce. What started as a simple family recipe has grown into a multi-billion dollar industry of hot wing franchises competing for the top spot. Hot wings have even become such a game day essential that rumors of chicken wing shortages almost always start floating around before the Super Bowl. And while Buffalo wings have clearly won over the nation, the city of Buffalo continues to celebrate its culinary masterpiece at the Buffalo Wing Festival each year, featuring over 100 different varieties of wings. 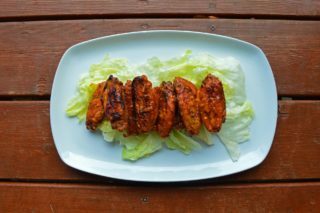 Looking for a unique twist on Buffalo chicken to serve on game day? Try our Buffalo Chicken Dip. For a vegetarian alternative, try our Buffalo-inspired Hot Wing Hummus.